Sunday 8 June 3.15 a.m. 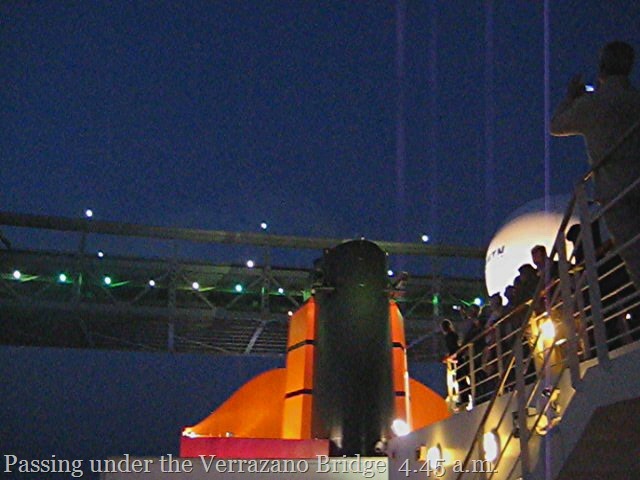 I had woken early, anxious not to miss our passing under the Verrazano-Narrows Bridge (that connects Staten Island to Brooklyn), a feat that had to be timed precisely to occur at 4.45 am to accommodate the soaring height of Queen Mary II. 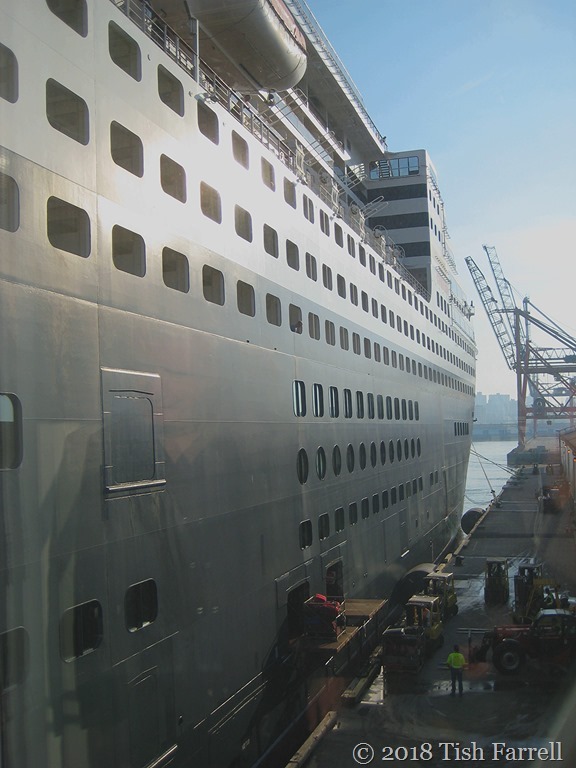 We had been at sea a week – for that’s how long the Queen Mary’s Trans-Atlantic Crossing takes – even now – and as the song goes – there had been nothing to see but sea. I was growing used to the meditative sameness of the view, and thinking I might just like to go on sailing forever. But then it was chilly too, and much of the time overcast; we saw not one sunset or sunrise, though one day I saw four dolphins. We spent our days and evenings after dinner roving the ship. You could walk miles, and often, despite the presence of 2,000 passengers and as many staff, we would find ourselves in utterly deserted quarters; silent but for the hum of ship’s engines. It was often very eerie, the more so after attending one of John Maxtone-Graham’s lectures on Titanic. He was Cunard’s resident historian, and his morning talks in the grand auditorium were one of the few activities we took part in. At 3.15 when I opened our veranda door it was like stepping into a steam bath. Somehow in the few hours between going to bed and making landfall there had been a complete climate change. All around were small craft, distant shore lights, sea birds flitting by like bats. It was a shock to see so many signs of life out there. 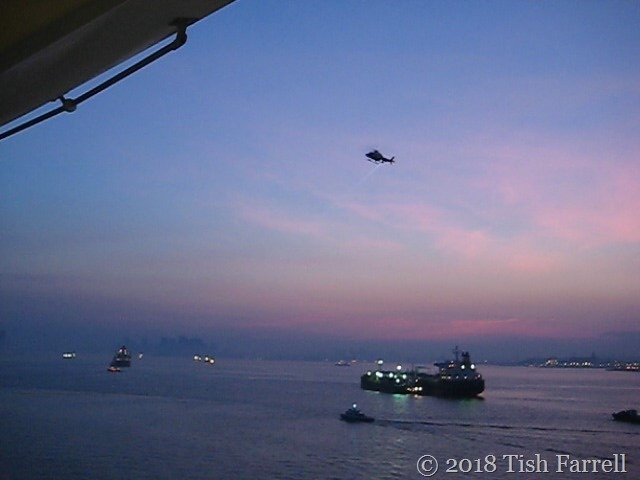 Soon the little Sandy Hook Pilot boat was heading our way, disappearing astern to deliver the pilot. A little while later I saw the boat veering off again, lights flashing. It seems that not only the pilot had come aboard. Later still, I came across two hugely scary flak-jacketed security men, one wielding a very large weapon. Overhead a chopper dogged our slow progress. The passage under the Verrazano Bridge went smoothly, complete with accompanying loud-speaker commentary from John Maxtone-Graham. It was all immensely theatrical like much else on Queen Mary II. 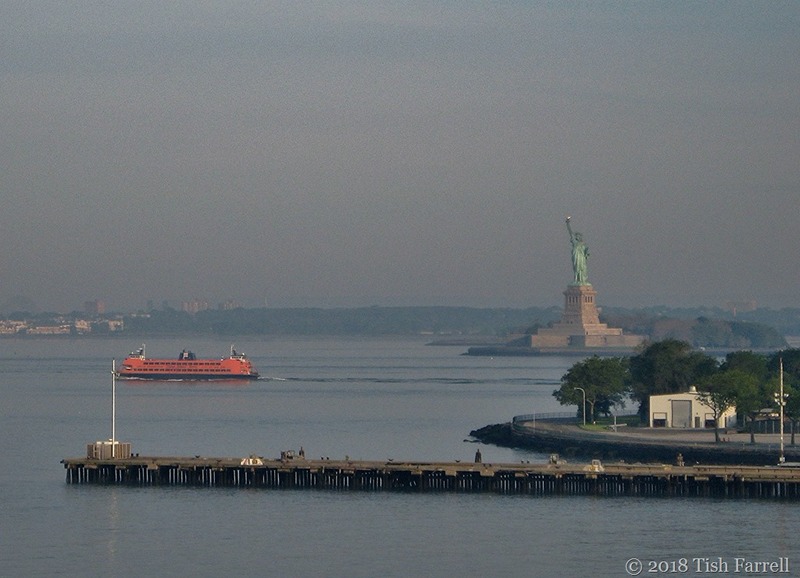 The regal arrival next involved a stately three-point turn in front of the Statue of Liberty, this in order to dock stern-first at Red Hook, Brooklyn. We put in at 6.a.m, right on schedule, a blood-red sunrise over the new IKEA building. We’re here. New York. The last time Graham made this crossing he was three years old. They had sailed on Cunard’s much smaller Medea, a civilised first class only ship. He and his parents were set to start a new life in London, Ontario, where his father was project managing engineering works in a new power station. This new life would begin with a few days in Manhattan and a visit to the Empire State Building before heading to Canada. There was another connection too. We were carrying with us a copy of a letter written by one of Graham’s ancestral family members, Robert Baxter, a Northamptonshire farmer’s son who made the crossing to New York in 1852, and described the appalling conditions he witnessed in steerage when he had to go below to fetch water for his own cabin. At that time the voyage took 21 days and passengers had to do their own cooking, although Robert said he felt so sick for two of those three weeks that he could mostly only manage to eat the home-made cake he had brought with him. There would have been no Statue of Liberty to greet their arrival. She did not sail in until 1885. New York is a dirty place but a wonderful place for business. It is very large. It appeared rather curious to see the telegraph posts and wires in all the principle streets and the railroad carriages running every quarter of an hour drawn by horses. They are beautiful carriages lined with silk plush. You can ride 3 miles for 5c. It is beautiful travelling. It is a splendid sight to see the fire engines and that is nothing new. I have seen them out 6 times in one day. Arrival in a new country is often fraught with anxieties, and US immigration is particularly fraught-making. We began our own adventure with mixed emotions, but then thoughts of Robert Baxter’s enthusiasm proved infectious. A week in Manhattan and old friends to catch up with. It was bound to be good. Please visit Debbie to see her stunning views of St Pancras Station. She kindly allows some of us to overstep the 6-word mark – just so long as we have a 6-word title. 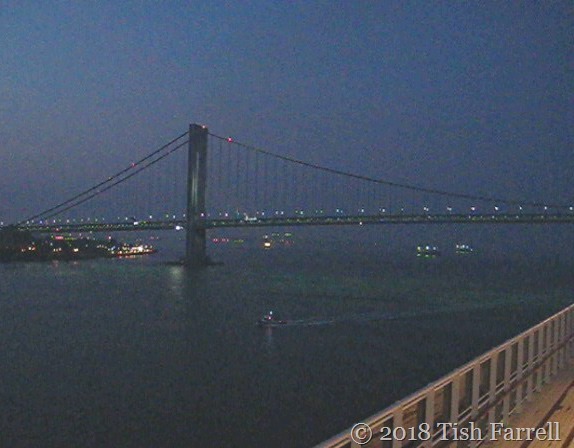 Posted on June 23, 2018 by Tish Farrell	This entry was posted in New York, Travel and tagged #6WS, #SixWordSaturday, Baxter family, NYC, Queen Mary II, Tish Farrell Writer, Varrazano Bridge. Bookmark the permalink. Wow, fantastic Tish. 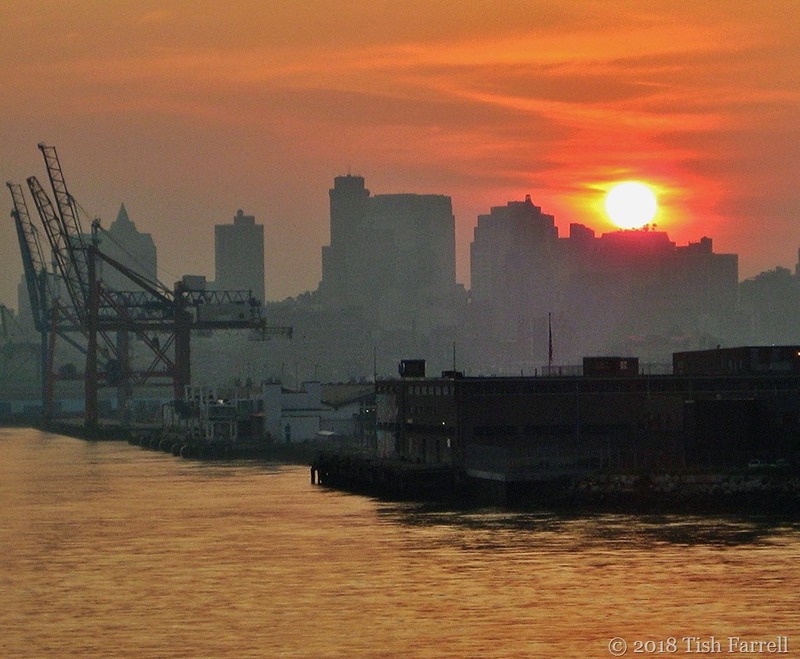 We love New York and have visited many times, but we’ve yet to arrive by ship. Amazing how on board among thousands of people you can still find private places. Great memories Tish and a beautiful sunrise setting the ocean on fire. What year was this? 2008 I think. How time flies! Fred: he made all the right moves, didn’t he. A trans-Atlantic crossing has got to be a genuine adventure. This post was wonderfully evocative, and I love the personal history you’ve added. Thank you… and welcome. I hope that you enjoyed your visit. I’m not a city person, but New York is one of a kind. Many thanks for your most appreciative words. 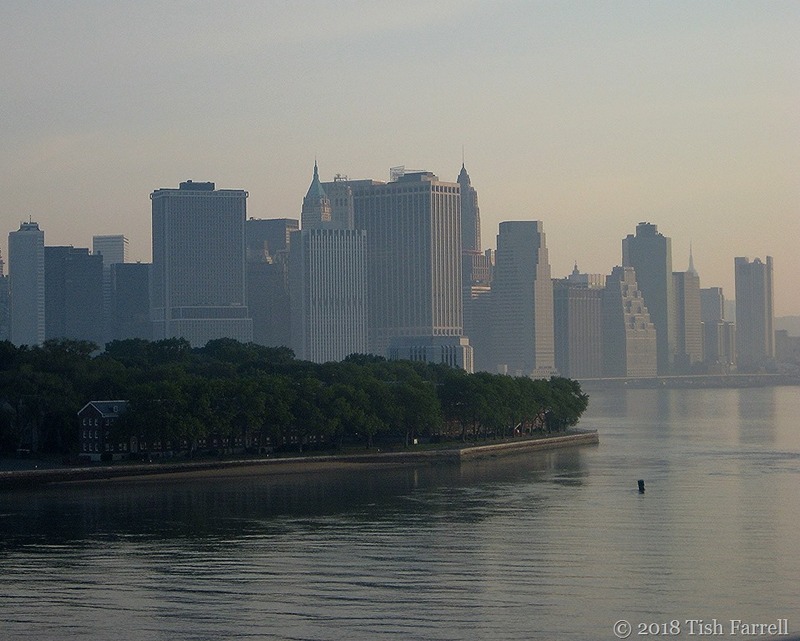 I’m not a city type either, but I did love New York, though it was so hot while we were there, 100 degrees, we spent an awful lot of time in Central Park. What an exciting entry to New York. Yes, I recall US Immigration being particularly fraught-making. It was even worse when we went to Boston a few years later. We all felt we needed debriefing afterwards. The arrival at New York after a week long journey at sea must have been a fascinating experience. 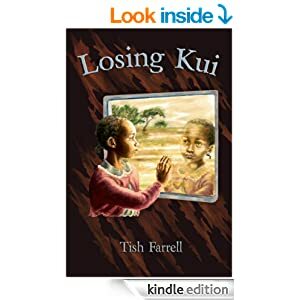 Great photos, Tish! It was quite a contrast between sedate sea travel to fast-track urban activity. Thank you. Peter. How very interesting this is. Not sure I’d enjoy the sea journey, but what a wonderful way to arrive in New York. Great family history connections too. The QM2 experience has its droll, OTT, downright weird moments, but the ship itself, and the library on board, to say nothing of the martini lounge and the jazz bar had a lot to recommend them. Obsessive compulsive joggers on the lovely promenade deck with its traditional steamer chairs, clocking up their circuits were another matter. The food was very good too. Oh sad. The Castle liners have quite a heritage of good hospitality. Wouldn’t it be interesting to get Mr. Baxters reaction to todays New York. Reading of your lovely adventure has improved my view of cruising, you made it sound like quite a cultural experience. Wonderful photos too. It must have been powerful! Ah now. Cunard themselves are mostly quite clear about this. The trans-Atlantic crossing is a crossing, not a cruise (though of course it does all the cruise ship stuff too). There were many aboard who were simply travelling to the US that way instead of flying, quite a numbers of American army officers and wives returning from overseas posts – so quite an unusual mix of souls aboard. It must have been quite an interesting experience, which your writing about it bore out too Tish. I always wanted to take that trip on a big ship. It is its own world. Wonderfully atmospheric. Again, I love the links with the past. Are you there now? A bygone trip. Would like to go sailing in a big ship again though. A cargo ship maybe. What an exciting way to arrive in New York! So incredibly cool to read your post today with the description of your experience and that of your ancestor. I can feel it! Many thanks, Ruth. The ancestral spirit did add a special dimension to the trip not least because we also learned while aboard that the whole development of the great trans-Atlantic liners like the first Queen Mary, with their elite quarters above, were mostly about providing cheap passage for large numbers of migrating poor below decks; and later still, providing affordable passage for those who had settled in the US to go and visit the home country once in a while. How lovely it must be to see all this by ship. The photos tell the story, especially the Statue of Liberty. Maybe the mention of the older trip by Graham’s relative is what did it… but reading this post reminded me of my own first trip to America, with hopes and determination to get higher education. It was a great adventure at a difficult time, and I learned a lot of unexpected things. Glad to hear you all are enjoying yourselves. That definitely sounds like a big adventure. A purposeful voyage with much at stake. My English generation rather took the obtaining of a higher education as a right, though you did have to get the appropriate grades of course. Oh my , just terrific!